Against the backdrop of the Tea Partyudominated GOP, former Florida governor Jeb Bush may appear comparatively moderate, but his record tells a different story. In Conservative Hurricane , Matthew Corrigan probes beyond the mild veneer, the sound bites, and the photo ops to examine the real evidence of BushAEs political leaningsuhis policies, politics, and legacy as the stateAEs most powerful governor. 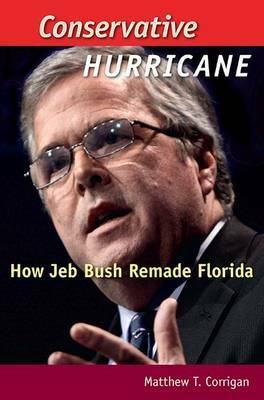 After remaking himself from a strident ideologue into a restrained conservative policy wonk, Bush became FloridaAEs first two-term Republican governor. The small government conservativeuwho in his second inaugural address dreamed of an idyllic Tallahassee free of government employeesuwas unstoppable. He presided over the largest accumulation of executive branch authority in the stateAEs history and advanced a multitude of social and economic reforms, the effects of which are still felt in the Sunshine State today. It was the beginning of a new kind of conservative activism, one that has only gained strength in the years since Bush left office. From the culture wars to the management of state government, Corrigan examines the governorAEs indelible mark on Florida. He demonstrates how the issues most closely associated with BushAEs leadership, including education reform, end-of-life decisions, and gun rights, would guide Republican governors in other states as they rode the rising tide of conservative populism. For anyone curious about a potential Jeb Bush presidency, this book is required reading.